Hydroquinone Skin Care Products - Are They Safe To Use? You may have heard about a skin bleaching and skin lightening chemical called hydroquinone. But do you know what it really is, how it works and whether it is safe or not to use on your skin? Hydroquinone is used in many skin lightening products but many people are still not aware if there are any risks involved in using these products. This article presents to you some of the research we have done in our quest to find out if hydroquinone is really a safe ingredient, and what alternatives might exist out there that could be a better choice for some people. Hydroquinone is a skin lightening ingredient that is used in most cosmetic skin lightener products. The primary function is to reduce melanin production in the skin. Whilst some people use hydroquinone-based products to help fade their naturally dark skin, it is generally used in mainstream products to help reduce the appearance of various types of skin hyperpigmentation problems like sun spots, age spots and acne markings. Hydroquinone is a proven ingredient when it comes to treating the various hyperpigmentation issues. For this reason, it continues to be used in products where it is legal to do so. 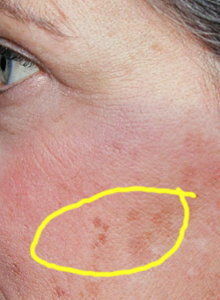 But questions are continuing to be raised about safety, and a number of countries have even banned hydroquinone and products that contain it from being sold over the counter; with prescription products and treatments from dermatologists being to the only avenue for people to access hydroquinone in some countries and regions. It is worth investigating why some authorities have taken the big step of banning hydroquinone for use by people in everyday skin treatment products. The debate continues about whether or not hydroquinone is a health risk. Plenty of research has gone into the issue, with many showing that consistent and widespread use of hydroquinone can result in some pretty serious skin problems, as well as more serious health problems. One researcher found that whilst hydroquinone will initially lighten the skin as it is meant to, over time and with prolonged use an oxidation process can start to take place – due to a reaction between the chemicals and sunlight. This can actually result in the skin then becoming darker; which leads to a person using even more hydroquinone based products to counter the side effects. The even more serious aspect is that this researcher found that over time the skin begins to become weaker and thus, the hydroquinone is able to reach the bloodstream more readily. It is when this occurs that the suspected health risks become concerning, as the chemical can more easily reach the organs (such as the liver and kidneys). Does this mean that people using hydroquinone-based skin lightening products for blemishes and hyperpigmentation should be worried? Most studies focus on very large doses of the chemical, so it is not yet certain whether much smaller doses pose such a risk. Your decision is an individual one and should consider all angles of opinion that exist on hydroquinone before using it. What Do The Health Authorities Say About Hydroquinone? The United States Food and Drug Administration (FDA) considers hydroquinone a potentially dangerous substance, however many dermatologists are confident that the ingredient is safe in small amounts. Such amounts as when not used for the purpose of bleaching the skin all over the face, neck and body, but instead when used moderately to reduce the appearance of blemishes such as age spots. It is thus up to the consumer to decide whether they are comfortable using a product that contains hydroquinone, whilst knowing the potential risks, no matter how small they are considered to be by some experts and authorities, even in small doses. Throughout the EU, hydroquinone is largely banned for over the counter sales. In the United States, a ban is in place for hydroquinone 4% products which can now only be accessed through a prescription. Hydroquinone 2% products are allowed for sale currently in the US, as an ingredient in over the counter skin treatment products. Some skin lightening product makers are now using safer and more natural alternatives. So it is now possible to find skin lightening creams without hydroquinone. The main alternative ingredient choice is arbutin, with kojic acid also being used in some products (see our Meladerm cream reviews for example, an all natural product). Pure arbutin is generally not used as it is a derivative of hydroquinone. However, it is the plant extracts that contain arbutin that are often used as ingredients in natural skin lightening products and these are becoming a preferred choice for people who are conscious of not only how well a skin lightener works, but what long term side effects it may have.